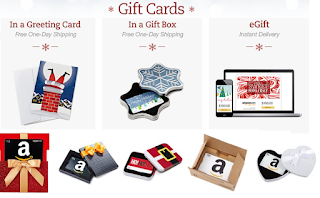 If you plan on buying Amazon Gift Cards as gifts this year check out the link below to buy your cards. You can pick from a variety of Metal boxes or other decorative boxes and they all come with Free One Day Shipping or instant email delivery and will arrive in plenty of time for Christmas. Great gift for somebody, Amazon sells everything and they can get anything they want on Amazon for great prices.